There are many advantages of artificial or Synthetic Grass for Dogs and their caretakers over real grass lawns or patches. It’s safer, looks better and helps save the dog owner money. Dogs explore the world with their mouths. Many dogs sicken or die from eating grass treated with fertilizers or pesticides or drinking rainwater runoff from treated lawns. Since artificial grass does not get pests and does not need to be fertilized, artificial grass is safer for dogs. 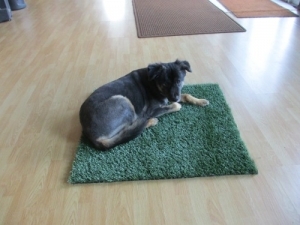 Unlike real grass, Synthetic Grass for Dogs won’t show any bald patches from digging doggy paws or urine stains. Since an artificial lawn doesn’t need mowing, it’s always the right length. The uniform green covering helps raise or retain the value of your property and keeps the neighbors happy. They say you get what you pay for. Not necessarily. In the long run, a dog owner pays more for real lawns but has more hassles to deal with. The best manufacturers of artificial grass will offer free shipping. On top of not having to mow, fertilize or treat for pests, you wind up saving money with synthetic grass than real grass.